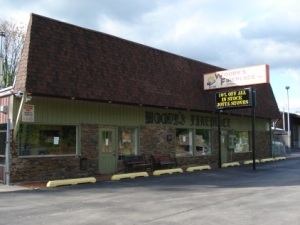 Woody’s Fireplace has been a family owned and operated business since it’s inception in 1976. Our business was started and is still owned by Gary and Mary Ellen Woods.The business is actively run and managed by Gary and his son Michael from our Larksville store. Our extensive Larksville showroom features over 50 burning displays to give you a better look at what we are capable of. Our warehouse space of over 10,000 square feet ensures that we have many models in stock along with all of the vent material and accessories you need. In our Honesdale location, we have Bill and Dee Carney, longtime Woody’s employees of over 20 years! Their knowledge and experience reflects their time here at Woody’s! Our Honesdale showroom features 35 burning displays for you to peruse. In our Bloomsburg locaton, we have Zona Brosious, who has been working with Woody’s for 5 years now! Our Bloomsburg showroom features 20 burning displays for you to experience. We have much to offer at Woody’s Fireplace. We carry decorative heating appliances that burn wood, coal, gas, pellets and other biomass fuel options. We also keep a full stock of bagged coal for your fuel needs. We provide professional service on everything that we sell and also carry a range of products for homeowners who choose to perform some of their own service. Our focus is to be able to provide excellent quality products and the most well trained staff available to service and install everything we sell. We place a major priority on training of our technicians so we can be sure that everything we do in your house will be extremely safe and done to the highest standard. The benchmark for this training in our industry is the NFI Certification. In addition to official certifications we also recieve constant updates and training bulletins from the manufacturers whose products we sell. These factors along with having all of the best tools and equipment for the jobs we perform assures we are able to get the job done safely, efficiently, and to a level of quality that will exceed your expectations. Here at Woody’s Fireplace we have been proud to service the stove and fireplace needs of all of Northeast PA for many decades and look forward to doing so for many more to come!